These are two fat acronyms. These acronyms relate to adipose (fat) stem cell-based procedures. SVF stands for “stromal vascular fraction”. SVF is, for lack of a better word, a fat extract. There is even a wiki page on SVF (which has the model image above) that is mostly accurate, but needs some work. To make SVF (a helpful review paper describes how to make SVF), fat isolated by liposuction is processed by collagenase treatment and centrifugation: all the goodies at the bottom of the tube including a whole bunch of different cell types (only one of which is mesenchymal stem cells: MSCs) constitute the SVF. SVF in fact contains many cell types including mesenchymal stem cells, pre-adipocytes (fat precursor cells), endothelial and pre-endothelial cells, stromal cells and non-cellular elements. Importantly, despite the heterogeneity of SVF, many doctors also simply call it “stem cells”, which seems misleading to patients. SVF is clearly a biological drug and has been defined as such by the FDA, but most physicians today doing transplants of SVF do not have an IND and are hoping to just forget that whole FDA thing. SVF can be cultured in a lab prior to transplantation into patients. Culturing seems to inherently change the properties of the cellular population as evidenced by decreased expression of the surface marker CD34 and increased CD105. Such culturing would also appear to inherently alter SVF in other ways that remain uncharacterized at this time. If you’ve ever been to Jamba Juice you know all about the BOOSTS that they will add to your drinks: Heart health, Antioxidant, Green Tea, Immune Boost, etc. Well, CAL is an autologous stem cell procedure that is basically a fat transfer procedure with a boost of SVF to increase its potency. The apparent first paper on CAL can be read here. It appears that the breast reconstruction that breast cancer survivor Suzanne Somers had was a CAL-like procedure. The procedure is called Cell Assisted Lipotransfer. Fat is sucked out of the stomach, half is harvested for stem cells, which are then added to the remaining half, and re-injected into the breast. Suzanne says a lumpectomy and radiation left her breasts lopsided. “This clinical trial that I started after completion will make this subject to being FDA approved, and paid for by insurance,” says Somers. Unfortunately I was not able to find any evidence of Somers’ procedure being part of any formal clinical trial. However, perhaps it is out there in the clinicaltrials.gov website and I just can’t find it. Anyone know? CAL too is also a biological drug to be regulated by the FDA, but as with SVF, most docs doing CAL don’t worry about that whole regulatory thing. And so often these procedures are being done in a non-homologous clinical context as well. In my opinion SVF and CAL have real clinical promise, but they need to be studied in the context of clinical trials. There are some ongoing, but not nearly enough (10 for SVF and just 1 for CAL). Meanwhile, hundreds of physicians around the world are doing transplants of SVF and doing CAL without regulatory approval. Hi Paul, I guess my major question is in the reference of SVF and “clearly being a biological drug” rightly regulated by the FDA and thus necisitates approval by them for use in human patients. 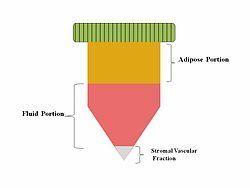 Should the seperation of SVF from adipose tissue be considered a procedure to create a “drug” any more than the seperation of blood into its’ constituent fractions be considered one? As a veterinarian, I am extremely confused by this extended defination of a “drug” by the FDA and thus establishing them to have regulatory contro lover its’ use. I have used autologus adipose stem cells in over 100 animals with no side effects and from my following similar stem cell use around the world with equally safe useage. Thanks for your help on this one. Thanks for the comment, Larry. The FDA at this time has indicated that SVF is a drug. That is probably the clearest part of all of this. You may disagree with them, but that’s their perspective. I see two explanations for this. First, SVF is not a purified single constituent of, for example, fat tissue so I’m not sure the analogy of separation of blood works in this case. SVF is a very heterogeneous product perhaps containing as many as a dozen or more cell types, non-cellular elements, etc. Second, SVF is produced using collagenase, which constitutes “more than minimally manipulation”. In addition there is the issue of non-homologous use. In order for a biological product to not be a drug, to my knowledge it has to be used in the same way that nature “uses it”. Thus using a fat-derived product (even if minimally manipulated) to treat for instance arthritis is non-homologous so I believe it would be a drug. By contrast using that to treat facial atrophy characterized by loss of facial fat perhaps is homologous. Maybe “clearly” was indeed a bit too definitive. See also my answer to Larry. What is clear is that the FDA considers SVF a drug. Exactly why and whether that is best policy are of course up for debate. My feeling is that SVF is a non-naturally occurring laboratory-produced biological product. SVF has far more than MSCs in it including adipocytes, pre-adipocytes, endothelial cells, endothelial cell precursors, fibroblasts, pericytes, blood cells (e.g. macrophages) beyond RBCs that are lysed, etc etc. (yes, these are all related cell types). It also contains dense, non-cellular elements that are spun down with the cells and may not be removed by subsequent washes, filtration, etc. In endogenous fat, these cells are in specific locations, not all combined and concentrated together. So SVF seems to me a human-made product that does not exist in nature and hence is a drug. I realize others see it differently. Oh this is great: remove cells from the body, culture in an artificial environment, culture changes in cell identity and put them back into the body. Considering the massive amounts of irrelevant cell culture data and the even greater lack of understanding about what we do to cells in cell culture, this can only be trouble. But such is the way of stem cell commercialisation: just get it to work, make money and fame, and worry later. SVF is not a drug in a world ruled by logic. This is cell therapy. Period.